John B. Smith, Jr. Also, it was announced that Bill Fosina was selected to become the new NE Region President. for a WWI Display exhibit at the Morris Plains, NJ, Museum. Click here to see a similar presentation that was presented to the Shooting Star Chapter 195.
with an optional group tour of the Ford Mansion – Washington's Headquarters, 30 Washington Place, Morristown. Executive Committee of the South African Air Force Association, is shown receiving AF Magazine. Click here for his talk. Rev. 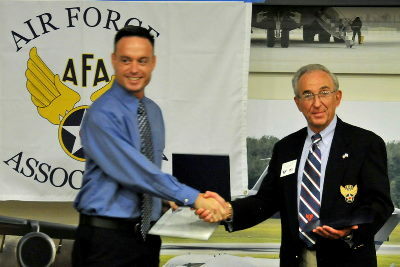 Trevor Slade, shown receiving AF Magazine from 195 and NJ President Bill Fosina. in the first B-25 to take off from the Carrier Hornet for the Tokyo Raid, April 18, 1942.
as the B-21 Raider after the Doolittle Raiders. Click here for photos taken on the USS Hornet just prior to the raid and others. NJ AFA Annual Meeting was held on July 30th, 2016, at NJ Aviation Hall of Fame. Mike Huelsenbeck of 360, retired MSgt, introduces Gen. Raymond Johns, our speaker, as they flew together on active duty. to spread the word with the general population. Also, he took many questions from the attendees. 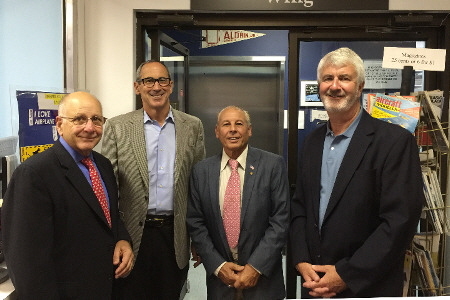 L-R: Bill Fosina, 195 and NJ AFA President, Gen Raymond Johns, USAF, ret., Joseph Capriglione, 190 President, and Patrick Thorton, who along with wife, Loretta, run the Skyway Foundation which provides annual Sal Capriglione Scholarships to NJIT AFROTC Detach 490 cadets. 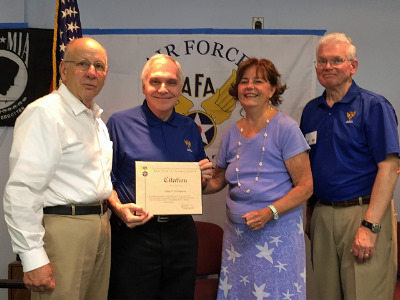 NJ AFA Meeting was held on November 7th, 2015, at Camp Evans, Wall, NY. B-29 Pilot Lt Col Thomas R. 'Bob' Vaucher (left) and B-17/24/25 Pilot BG James E. Young, ANG, ret. (right). BG James E. Young, ANG, ret., VP of Hangar One Chapter 192, inducted into NJ Aviation Hall of Fame. 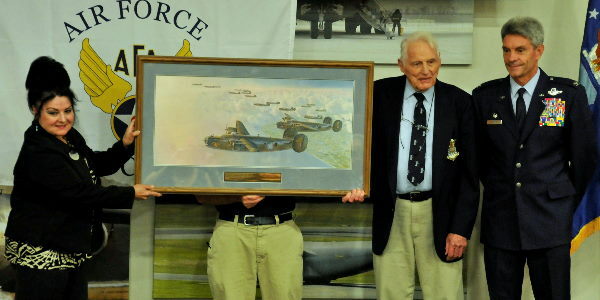 On Tuesday, September 29th, our own, BG James E. Young, ANG, AFA Life-member and VP of Hangar One Chapter 192 and past NJ AFA President in 1985-86, was inducted into the NJ Hall of Fame and Museum for his outstanding service to our country. WW II Service: 43 B-24/25 Anti-sub missions, 10 B-24 and 34 B-17 European Combat missions. 489 Combat Hours against targets including Ploesti Oil Fields, Munich, Berlin, and Schweinfurt. USAF recalled to active duty: Korean Conflict, 1951-52, and the Berlin Crisis, 1961-62. Commander - ANG 170th Military Airlift Group and Air Refueling Group, McGuire AFB: Aug. 1, 1967 to Aug. 1, 1979. Over 11,000 flying hours. His name will be soon be added to their "Hall of Fame Inductees" page for 2015 along with Janis Blackburn and Henry Holden. See: http://www.njahof.org/halloffame.htm. For dedication ceremony, see: https://www.youtube.com/watch?v=H5wO7H_hphg. 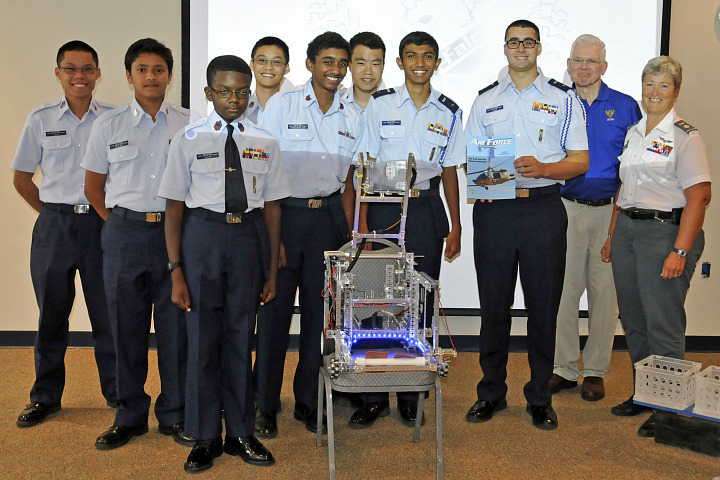 At the NJ AFA Convention at NJ Aviation Hall of Fame on August 1st, 2015, members of the Raritan Valley Composite Squadron, Civil Air Patrol, robotics teams gave a slide presentation on their program followed by a robotic demo. 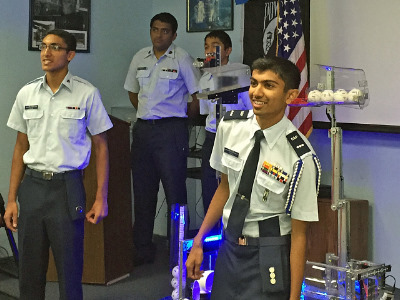 Left to right: C/A1C Alok Pillai, CyberRaptors; C/SSgt Krishan A Patel, CyberFalcons; C/MSgt Udit R Patwal, CyberRaptors; and C/Capt Vatsal J Patel, CyberFalcons. Left to right: Maxine Rauch, NER President; Jeremy Milonas; and Howard Leach, NJ President. 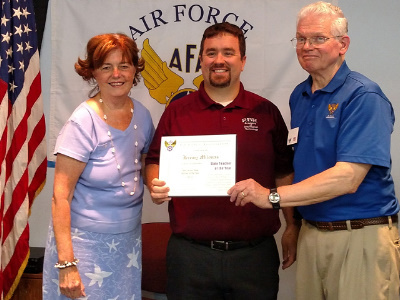 Jeremy Milonas, teacher at Red Bank Regional High School, was awarded the NJ Air Force Association Teacher of the Year Award for his accomplishments in engaging students about science, technology, engineering, and math (STEM). 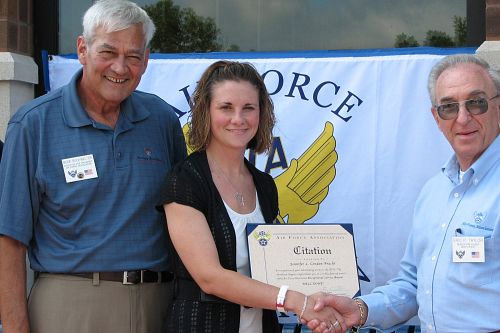 The Award includes a certificate, $500.00 check, jacket, and a Civil Air Patrol Aerospace Education Membership. Jeremy Milonas helped with five CyberPatriot VII teams: three from Red Bank Regional High School, and two from Markham Place Middle School, Little Silver, NJ. The Red Bank Regional High School Team Maroon placed fourth nationally in the Open Division. The two middle school teams placed second and third nationally in the Middle School Division. And the Markham Place Middle School second place national team was an all-girls team. See him in the photo of the Middle School runner-up trophy presentation at the CyberPatriot VII National Finals on the "CyberPatriot" page. Left to right: Bill Fosina, 195 President; Toby Terranova; Maxine Rauch, NER President; and Howard Leach, NJ President. Toby Terranova received the Exception Service Award primarily for his work with National on a Facebook membership ad along with his ongoing support of the 195 Web Site and the 195 and NJ VP of Membership activity. Thanks Toby! 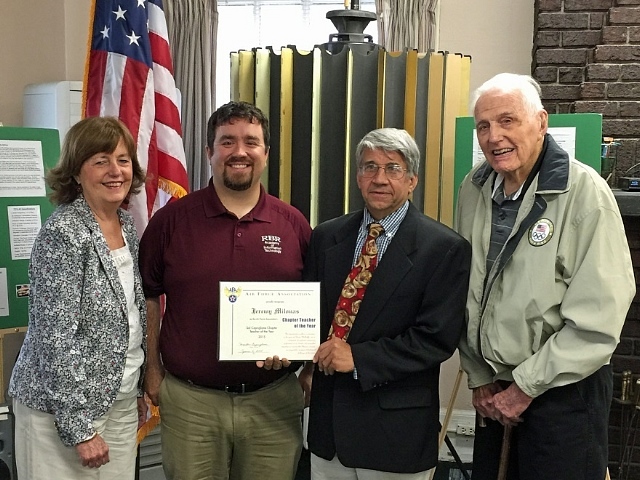 Left to right: Bill Fosina, 195 President; Cole Kleitsch, 195 VP; Maxine Rauch, NER President; and Howard Leach, NJ President. 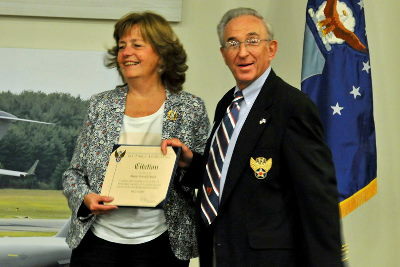 Cole H. Kleitsch , 195 VP, receives his Medal of Merit Award for his extensive support at Air Force Wounded Warriors Trials at West Point Military Academy in June of 2014. Many thanks, Cole! Not shown is a Medal of Merit award to Stephen J. LaPoint, former President of Mercer County Chapter 293 who moved to Florida, for his 3.5 years of service as Mercer County Chapter 293 President. All the best to you, Steve! 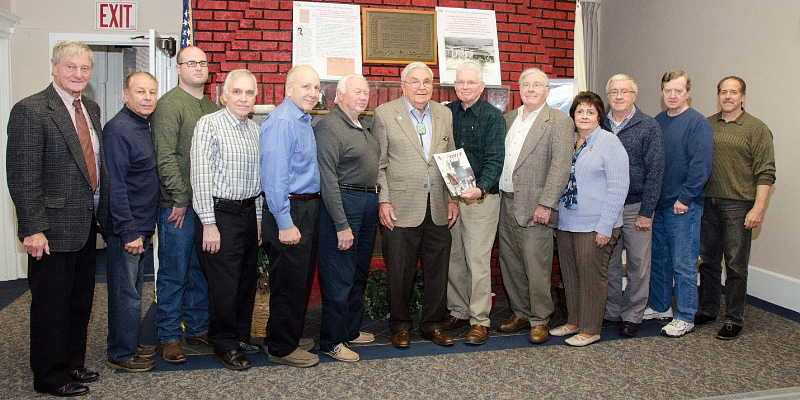 The above, taken at our quarterly meeting on Sat., June 6th, 2015, D-day plus 71 years, in the Marconi Hotel lobby lounge, at Camp Evans, Wall, NJ. 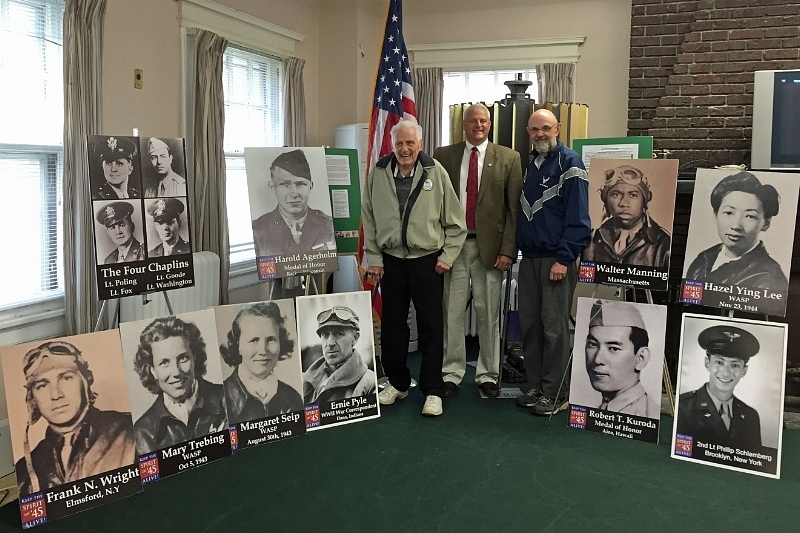 Cole Kleitsch, VP 195, center, gave a briefing on the National "Spirit of '45 Day" program along with ten posters celebrating the contributions of WWII heros and heroines. Also shown on left is BG James E. Young, ANG, ret., VP 192, and past NJ AFA Pres, 1985, 86, who flew a B-17 on D-day, and on the right Lt Col Thaddeus (Ted) Barnas, USAF, ret., 192 VP of AE in the soon to be reactivated Hangar One Chapter 192. The National "Spirit of '45 Day" organization celebrates the Greatest Generation and will be doing it again on the 70th anniversary of the end of WWII on 8/14/15. Cole Kleitsch gave is a little history of some of the posters. We paid tribute to Jim Young, VP 192, a member of that Greatest Generation, with a review of one the units he served in during WWII. He served in three Bomb Groups, the 456th and 301st within the 15th AF, and the 447th within the 8th AF. Using the book 'The Mighty Eighth in WWII' by Graham Smith which gave some historical accounts of the 447th BG, we presented him with a copy of the book with tabs where there was a reference to the 447th BG. We also paid tribute to his service in the Air National Guard where he was eventually Commander of the 170th Air Refueling Group which transitioned to KC-135's at McGuire AFB on 1 April 1977. 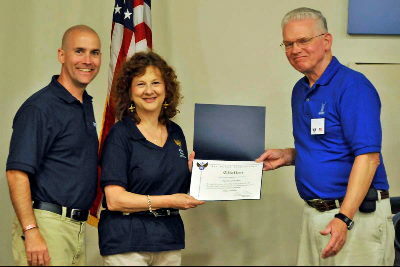 On June 6th, 2015, Maxine Rauch, NER President, on left, helped to present the Chapter 190 Teacher of the Year Award to Jeremy Milonas, center, of Red Bank Regional High School, by Martin Capriglione, 190 Secretary/Treasurer, and BG James E. Young, ANG, ret., VP 192, and past NJ AFA President, 1985,86. Jeremy Milonas was the assistant coach of the National CyberPatriot VII 2nd Place Middle School team as well as other teams. 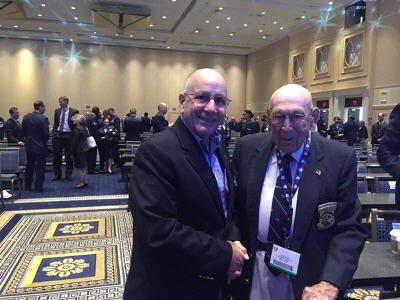 Click here to see him at the trophy presentation, on right next to the AFA Chairman of the Board (on the CyberPatriot page). He was subsequently selected to be the NJ AFA 2015 Teacher of the Year and will be presented with this award on Sat., August 1st, at the NJ AFA annual conference. 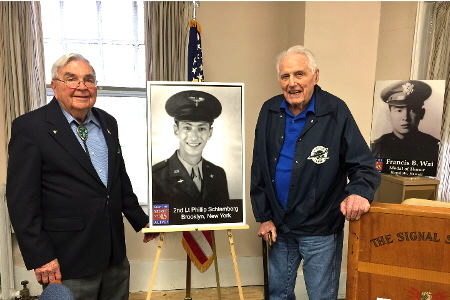 Left to right: Art Snyder, B-26, 29 Pilot; Joe Capriglione, 190 Pres. ; Ryan Misare, 360 Pres. ; Toby Terranova, NJ Chaplain; Bill Fosina, 195 Pres. ; Norm Mathews, Former 293 and NJ Pres; Thomas R. 'Bob' Vaucher, B-29 Pilot; Howard Leach, NJ Pres. ; George Filer, KB-50J Pilot, 310 Pres. ; Jo Bair, 293 Secretary; Stewart Zitzner, 293 and NJ Treasurer; Ken Angrason, 192; and Anthony Devino, 190 VP. 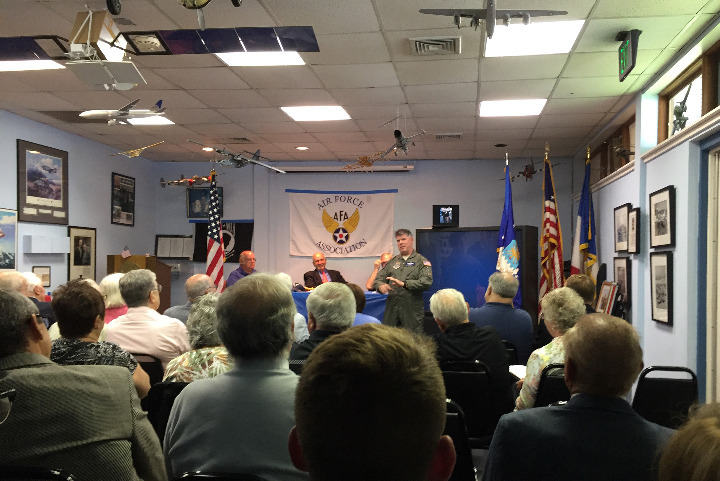 On Nov 1st, the NJ Air Force Association held a quarterly meeting at Camp Evans, Wall Township, NJ, with two B-29 Pilots in attendance. The first and speaker was Lt Col Thomas R. 'Bob' Vaucher, Bridgewater, NJ, the WWII B-29 Pilot who led the B-29 Show of Force over the Battleship USS Missouri during the Japanese surrender, September 2, 1945. The show of Force consisted of 525 B-29's which took off in 45 second to one minute intervals from their bases to form up at designated locations. And then, at the time of the surrender, flew over the Battleship Missouri for an extended period of time. The second, 1st Lt Arthur L. Snyder, Cranford, NJ, served three years in the Orient, flying two B-26 tours in Korea and one in Indochina where he flew B-29 covert missions for the CIA. 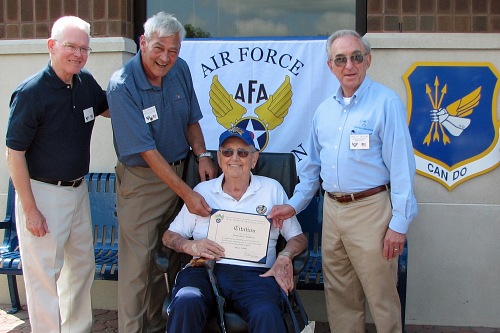 He returned in the fall of 1954 and was a flight instructor in the B-57 before his discharge in 1955. 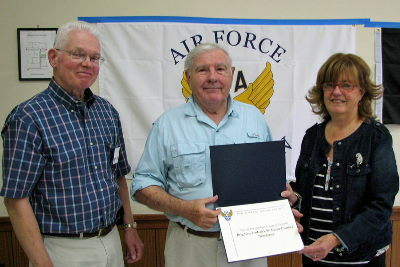 L-R: Norm Mathews, Former 293 and NJ Pres; Jo Bair, 293 Secretary; Howard Leach, NJ Pres. ; and Stewart Zitzner, 293 and NJ Treasurer. The above members of the Mercer County Chapter 293 receive their AFA 2013-14 Community Partner Gold Award which was presented by Howard Leach, NJ Pres., who received it from the AFA Chairman and Vice Chairman of the Board for Field Operations at the AFA National meeting on September 13th, 2014. Mercer County Chapter 293 has ten Community Partners which is outstanding for their size. 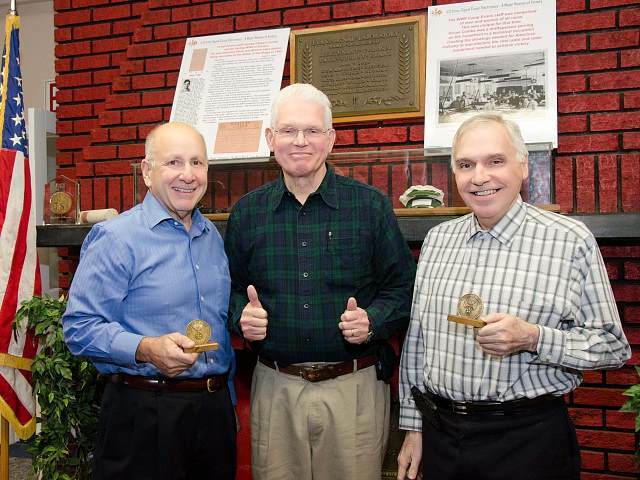 Bill Fosina and Toby Terranova finally receive their Medal of Merit Awards from Howard Leach with a thumbs up appreciation for all they do for the AFA. 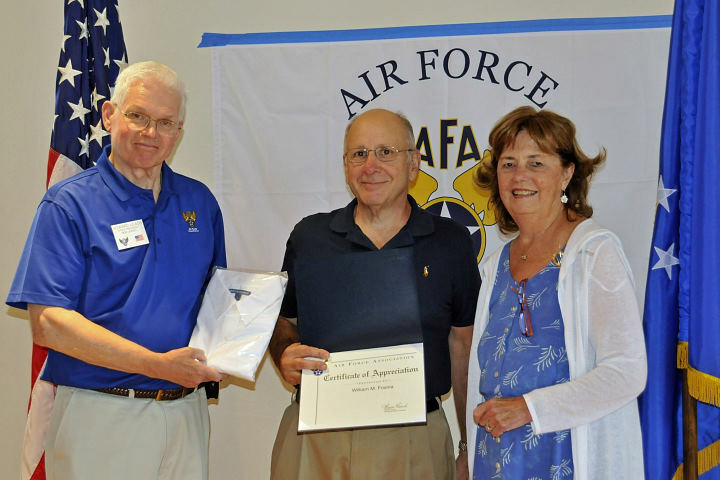 To see their contributions, scroll down to their recognition photos taken at the NJ AFA Convention at Joint Base McGuire-Dix-Lakehurst on July 26th, 2014. L-R: William Fosina, 195 Pres. ; Howard Leach, NJ Pres. ; and Toby Terranova, NJ Chaplain, 195, NJ VP of Membership, and 195 Secretary. The above photo was taken in the lobby of the former Marconi Hotel, dedicated 100 years ago in 1914. According to their web site, Camp Evans was once the 1914 Marconi Belmar Trans-Atlantic Wireless station, the first campus of The King's College, involved in WWII radar development, and initiated space communications in 1946. It was also a cold war technology, nuclear weapons, and space research site, the birthplace of satellite hurricane tracking, and a black history site. 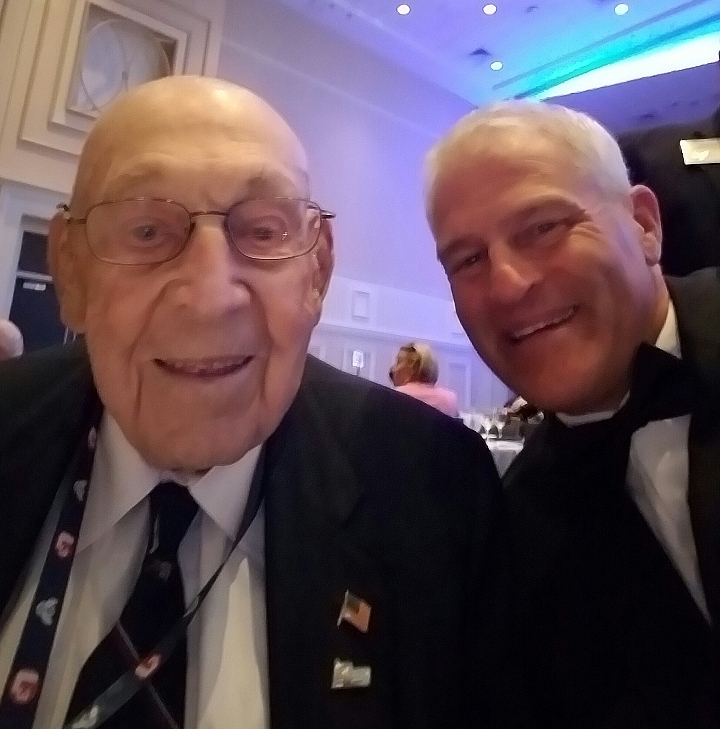 As you know, Doc was an Army Chaplain and according to Bob Nunamann, was talking about High Point Chapter plans from his sick bed soon after he was taken to the hospital. "Richard F. 'Doc' Ball has been High Point Chapter 374's President for the last three years; he was also the AFA NJ Chaplain. 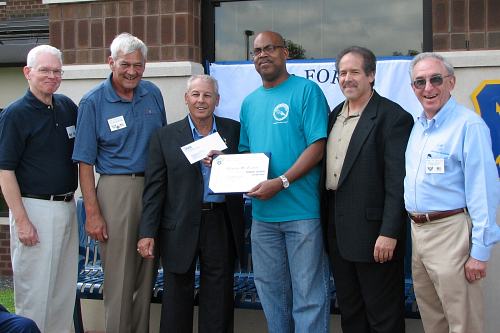 Through Richard's untiring leadership efforts and creative ideas he was able to reach out to local veterans groups, the community, educators, CAP, and local politicians as never before, to promote AFA's public image and goals. 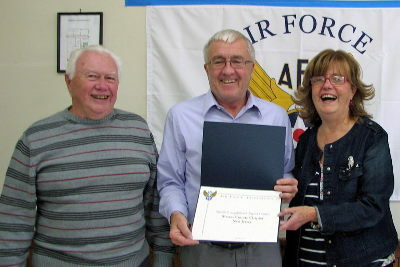 Richard also led the High Point Chapter's efforts in significant fund raising which was used for support of local veterans including donations of $250 each to the Sussex County Veterans Memorial Cemetery, the Vietnam Veterans of America VVA-1002 Wallkill Valley Chapter Food Pantry, and the AFA HQ Wounded Airman Project." See him receiving that award below on March 16th, 2013. Finally, we got to see him at the last NJ Convention on July 26th, 2014. Farewell Doc, 'til we meet again! At the NJ AFA Convention at Joint Base McGuire-Dix-Lakehurst on July 26th, the CyberFalcons Robotics team of the Raritan Valley Composite Squadron, Civil Air Patrol, gave a slide presentation on their program followed by a robotic demo of picking up items and of chinning itself. 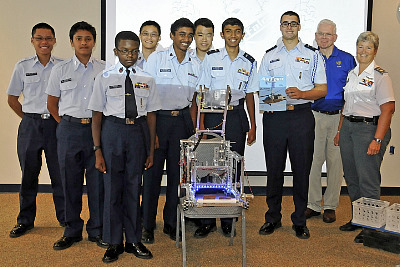 L-R: Cadets Alexander Shu, Pranav Bhojraj, Jordan Daley, Trevor Shu, Akil Ponnambalam, Garret Leung, Vatsal Patel, and James Case, Howard Leach, NJ President, AFA, and Lt Col Amy Myzie, Commander, Raritan Valley Composite Squadron, Civil Air Patrol, with the Robot seated. Other team members Kishan Patel and Aravind Ramakrishnan and coach Capt Jaysin Maskarenas are not shown. 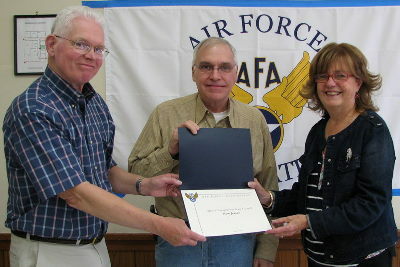 The NJ AFA made a $500.00 donation toward their program. Also, at the NJ AFA Convention at Joint Base McGuire-Dix-Lakehurst on July 26th, 2014, William Fosina, 195 President receives the National Medal of Merit Award. As 195 VP of Community Partners, he recruited a number of new community partners as well as members. He also contacted existing or expiring partners to help reinvigorate their participation. Bill also served as a NJ Delegate at the AFA National Convention and attended the AIR & SPACE Conferences in 2013 and 2014. L-R: Howard Leach, NJ President, William Fosina, 195 President, and Maxine Rauch, NE Region President. 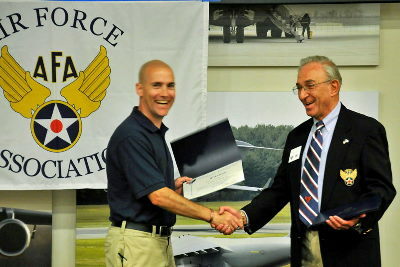 Also, at the NJ AFA Convention at Joint Base McGuire-Dix-Lakehurst on July 26th, 2014, Tobia (Toby) Terranova, receives the National Medal of Merit Award for his outstanding service to the NJ AFA. 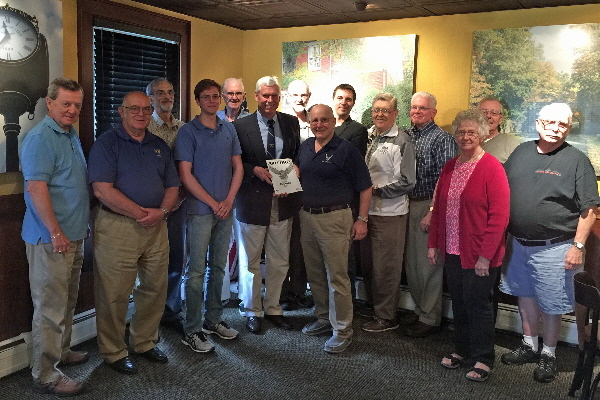 This included: serving as the Chapter 195 Secretary, enhancing and maintaining the Shooting Star Chapter 195 web site, giving Chapter 195 talks on the 'Boeing X-37 Spaceplane - Part 1 and 2, and another on "Unmanned Aerial Vehicles: The Air Force and Automated Flying – Part 1." He also helped man a table at the Plane Pull / Special Olympics/ Family Day at Newark Liberty International Airport and serves as the VP of Membership for 195 and NJ. He sends monthly reminders to those whose membership has expired with a creative letter. He has scanned 195 and NJ historical documents for future display. L-R: Howard Leach, NJ President, Toby Terranova, 195 Secretary, and Maxine Rauch, NE Region President. 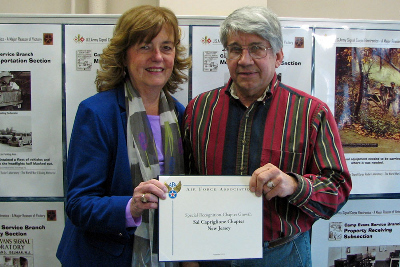 At the NJ State meeting, held on Saturday, March 8th, 2014, Martin Capriglione, 190 Secretary/Treasurer, was presented with the AFA Special Recognition – Chapter Growth Sal Capriglione Chapter Award by NE Region President Maxine Rauch, on left. At the NJ State meeting, held on Sat, Nov 2nd, 2013, the newly elected NJ officers were installed and the following awards were presented by the new NE Region President, Maxine Rauch. The following meeting highlight photos were taken by Toby Terranova, NJ VP of Membership and 195 Secretary. Thanks, Toby! 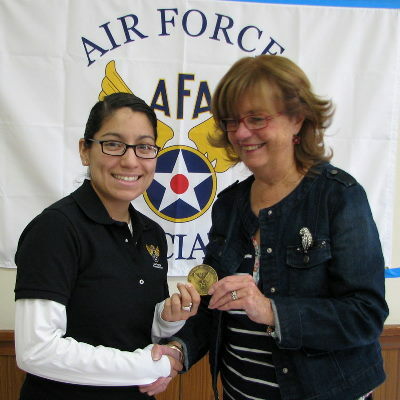 On left, Maritza Mendoza, NJ VP and 360 President, was presented with her Medal of Merit Award by the new NE Region President Maxine Rauch, on right. On left, Maritza Mendoza, NJ VP and 360 President, along with Ryan Misare, NJ Secretary and 360 Treasurer, were presented with the AFA 360 Large Chapter Overall Retention Award by NE Region President Maxine Rauch, on right. On left, Howard Leach, NJ and 195 Pres, along with Toby Terranova, 195 Secretary and 195 and NJ VP of Membership, were presented with an AFA 195 Special Recognition NJ Growth Award by NE Region President Maxine Rauch, on right. On left, Norm Mathews, Past NJ and 293 Pres, along with Stewart Zitzner, NJ Treasurer and 293 VP of Veteran's Affairs, were presented with an AFA 293 Special Recognition Growth Award by NE Region President Maxine Rauch, on right. 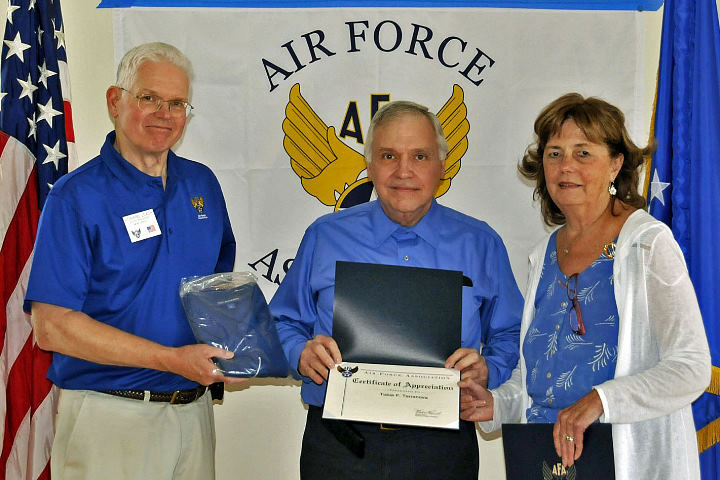 On left, Howard Leach, NJ and 195 Pres, congratulates George Filer, 310 President, as he is presented with an AFA 310 Special Recognition Growth Award by NE Region President Maxine Rauch, on right. The following are some highlights at the last AFA New Jersey State Convention, which was held jointly with New York on Saturday, August 24th, 2013, at the C-17 Maintenance and Operations Facility, 2202 W. Arnold Ave., Joint Base McGuire-Dix-Lakehurst, NJ, sponsored by Chapter 360. The following highlight photos were taken by Toby Terranova, NJ VP of Membership and 195 Secretary. The following AFA national awards were presented by NE Region President Eric Taylor. On left, President Maxine Rauch, NY President is presented with an AFA Exceptional Service Award by NE Region President Eric Taylor, on right. On left, Bill Horay, Past 360 President is presented with an AFA Medal of Merit Award Certificate by NE Region President Eric Taylor, on right. 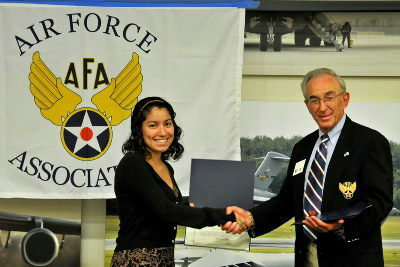 On left, Maritza Mendoza, 360 President is presented with an AFA Medal of Merit Award Certificate by NE Region President Eric Taylor, on right. On left, Kenny Scott, 360 VP of Community Partners is presented with an AFA Medal of Merit Award Certificate by NE Region President Eric Taylor, on right. 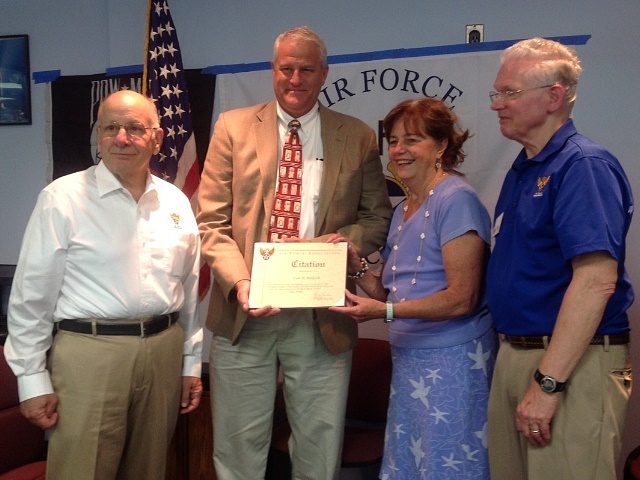 In center, Susan Loricchio, NJ VP of Government Affairs is presented with an AFA Medal of Merit Award Certificate by NJ President Howard Leach, on right, and Past 360 President Bill Horay on left. On left, SMSgt Joey Bailey, USAF, gave a talk on his recent Afghanistan tour and was presented with a NJ Joint Legislative Resolution by Col. Kevin J. Keehn, ANG, Commander, 108th Wing. 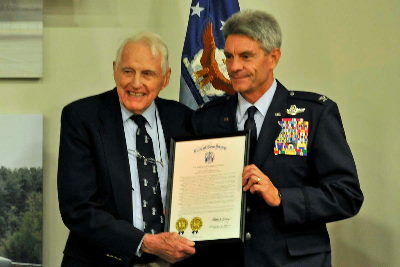 On left, BGen James Young, ANG, who gave a talk on his WWII 44 B-17/24 Combat Missions was presented with a NJ Joint Legislative Resolution by Col. Kevin J. Keehn, ANG, Commander, 108th Wing. 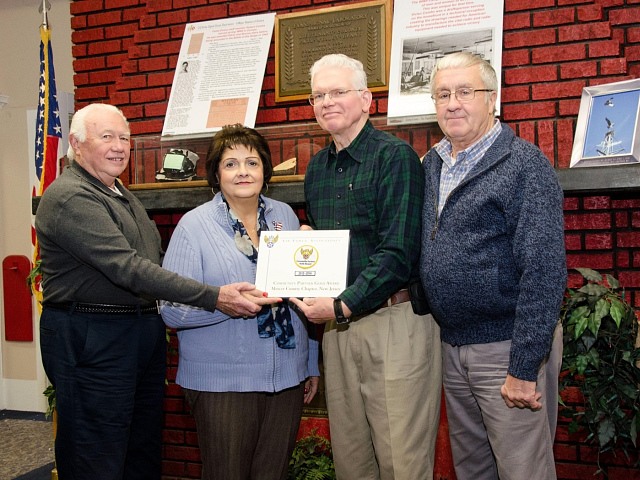 Below, Marialicia Ryan-Cirillo, Library Director, receives the Keith Ferris B-24 'Circus Outbound' Print which was dedicated in honor of BGen James James Young, ANG, ret., for his WWII B-17/24/25 missions including Normandy and service with the ANG 170th Air Refueling Group, SAC. 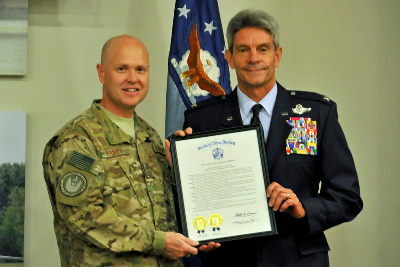 Col. Kevin J. Keehn, ANG, Commander, 108th Wing, which is the successor unit of the 170 ARG, is on the right. The Print will be unveiled in the War Room at 1:30 PM, Wed, Dec 4th, during a Pearl Harbor Remembrance event. "Dedicated, by AFA NJ 24Aug2013, in honor of BGen James E. Young, ANG, ret., who flew WWII B-25 anti-sub missions - East Coast, flew 10 B-24 missions with the 456th BG, 304th BW, 15th AF , and 34 B-17 missions with the 301st BG, 5th BW,15th AF, and 447th BG, 3rd Div, 8th AF, and served with the ANG 170th MAG and as Cmdr 1Aug 67 -79 and on 1 Apr 77 when it transitioned to the 170th ARG, McGuire AFB, with KC-135s." 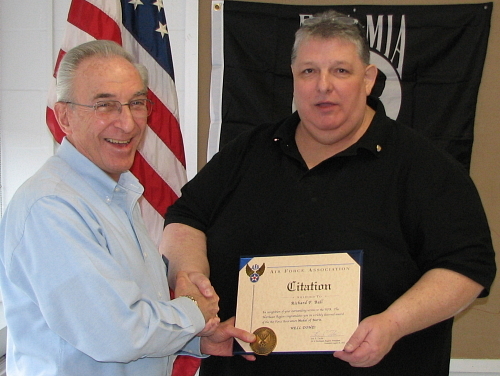 At the NJ Executive Meeting Committee meeting on March 16th, 2013, in Morris Plains, NJ State Chaplain Richard F. ("Doc") Ball (r), President, High Point Chapter 374, was presented with his AFA National Medal of Merit Award by Eric Taylor, NE Region President. Chaplain Ball has reached out to local veterans groups, the community, educators, CAP, and local politicians to promote AFA's public image and goals. He has also led the High Point Chapter's efforts in significant fund raising which has been used to support the Sussex County Veterans Memorial Cemetery, the Vietnam Veterans of America VVA-1002 Wallkill Valley Chapter Food Pantry, and the AFA HQ Wounded Airman Project. L-R: David Buckwalter, Exec VP and Acting Pres, AFA, presents an Exceptional Service Award Citation to Jennifer Condon-Pracht, McGuire Chapter 360, Pres, with Eric Taylor, Northeast Region Pres. Also, the following award pictures are also in the article as the 5th and 6th pictures down. L-R: Howard Leach, NJ Pres, and David Buckwalter, Exec VP and Acting Pres, AFA, presents a Medal of Merit to Nick Mullaney, Chapter 192 Pres, with Eric Taylor, Northeast Region Pres. L-R: Howard Leach, NJ Pres, David Buckwalter, Exec VP and Acting Pres, AFA, and Joseph Capriglione, Chapter 192 VP Membership, presents the Sal Capriglione Chapter 192 Teacher of the Year Award and check to Maj. Charles M. Taylor, USAF, (ret.) with Anthony Devino, 192 Pres, and Eric Taylor, NE Region Pres. Major Charles M. Taylor, USAF, (ret. 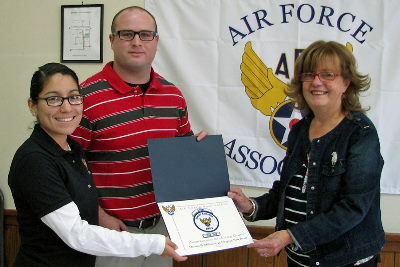 ), is the Senior Aerospace Science Instructor for AFJROTC unit NJ-761 at Piscataway High School, Piscataway, NJ.